Jet Propulsion Labs (JPL) is reporting that new research is emerging from the final orbits of NASA's Cassini spacecraft, which represents a huge leap forward in the understanding of the Saturn system — especially the mysterious, never-before-explored region between the planet and its rings — some preconceived ideas are turning out to be incorrect, while new questions are being raised. Artistic rendition of the Cassini spacecraft on orbit around Saturn. Image is courtesy of JPL. 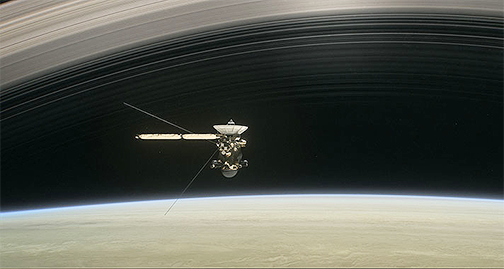 Six teams of researchers are publishing their work October 5 in the journal Science, based on findings from Cassini's Grand Finale. That's when, as the spacecraft was running out of fuel, the mission team steered Cassini spectacularly close to Saturn in 22 orbits before deliberately vaporizing it in a final plunge into the atmosphere in September of 2017. Knowing Cassini's days were numbered, the mission team went for gold. The spacecraft flew where it was never designed to fly. For the first time, it probed Saturn's magnetized environment, flew through icy, rocky ring particles and sniffed the atmosphere in the 1,200-mile-wide (2,000-kilometer-wide) gap between the rings and the cloud tops. Not only did the flight path push the spacecraft to its limits, the new findings illustrate how powerful and agile the instruments were. Complex organic compounds embedded in water nanograins rain down from Saturn's rings into its upper atmosphere. Scientists saw water and silicates, but they were surprised to see also methane, ammonia, carbon monoxide, nitrogen and carbon dioxide. The composition of the organics is different from that found on moon Enceladus —- and also different from that on moon Titan, meaning there are at least three distinct reservoirs of organic molecules in the Saturn system. For the first time, Cassini saw up close how rings interact with the planet and observed inner-ring particles and gases falling directly into the atmosphere. Some particles take on electric charges and spiral along magnetic-field lines, falling into Saturn at higher latitudes — a phenomenon known as "ring rain." But scientists were surprised to see that others are dragged quickly into Saturn at the equator. And it's all falling out of the rings faster than scientists thought — as much as 22,000 pounds (10,000 kilograms) of material per second. Scientists were surprised to see what the material looks like in the gap between the rings and Saturn's atmosphere. They knew that the particles throughout the rings ranged from large to small. But the sampling in the gap showed mostly tiny, nanometer-sized particles, like smoke, suggesting that some yet-unknown process is grinding up particles. Saturn and its rings are even more interconnected than scientists thought. Cassini revealed a previously unknown electric-current system that connects the rings to the top of Saturn's atmosphere. Scientists discovered a new radiation belt around Saturn, close to the planet and composed of energetic particles. They found that while the belt actually intersects with the innermost ring, the ring is so tenuous that it doesn't block the belt from forming. Unlike every other planet with a magnetic field in our Solar System, Saturn's magnetic field is almost completely aligned with its spin axis. The new data shows a magnetic-field tilt of less than 0.0095 degrees. (Earth's magnetic field is tilted 11 degrees from its spin axis.) According to everything scientists know about how planetary magnetic fields are generated, Saturn should not have one. It's a mystery that physicists will be working to solve. Cassini flew above Saturn's magnetic poles, directly sampling regions where radio emissions are generated. The findings more than doubled the number of direct measurements of radio sources from the planet, one of the few non-terrestrial locations where scientists have been able to study a radio-generation mechanism that is believed to operate throughout the universe. For the Cassini mission, the science rolling out from Grand Finale orbits more than justifies the calculated risk of diving into the gap — skimming the upper atmosphere and skirting the edge of the inner rings, said Cassini Project Scientist Linda Spilker, adding that lmost everything going on in that region turned out to be a surprise," Spilker said. "That was the importance of going there, to explore a place we'd never been before. And the expedition really paid off — the data is tremendously exciting. Many mysteries remain, as we put together pieces of the puzzle," Spilker said. "Results from Cassini's final orbits turned out to be more interesting than we could have imagined." "Chemical interactions between Saturn's atmosphere and its rings," by J.Hunter Waite, et.al. "D-Ring dust falling into Saturn's equatorial ionosphere and upper atmosphere," by Donald Mitchell, et.al. "In-situ collection of dust grains falling from Saturn's rings into its atmosphere," by Hsiang-Wen Hsu, et.al. "A radiation belt of energetic protons located between Saturn and its rings," by Elias Roussos, Peter Kollmann, et.al. "Saturn's magnetic field revealed by the Cassini Grand Finale," by Michele Dougherty, et.al. "The low frequency source of Saturn's Kilometric Radiation (SKR)," by Laurent Lamy, et.al. The Cassini-Huygens mission is a cooperative project of NASA, ESA (European Space Agency) and the Italian Space Agency. NASA's Jet Propulsion Laboratory, a division of Caltech in Pasadena, manages the mission for NASA's Science Mission Directorate in Washington. JPL designed, developed and assembled the Cassini orbiter. The radar instrument was built by JPL and the Italian Space Agency, working with team members from the U.S. and several European countries.